NIA CHARLESTOWN NEVIS (November 30, 2018) — His Excellency Francisco J. Bernales, Non-Resident Chilean Ambassador to St. Kitts and Nevis paid a courtesy call on Hon. Alexis Jeffers, Deputy Premier of Nevis, at his Charlestown office on November 29, 2018. Mr. Jeffers represented Hon. Mark Brantley, Premier of Nevis and St. Kitts and Nevis’ Minister of Foreign Affairs who was off island on government business. 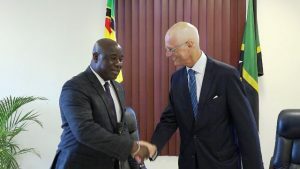 The Ambassador’s visit to Nevis comes one day after he presented His Excellency Sir Tapley Seaton, Governor General of St. Kitts and Nevis, with his credentials. In brief remarks Mr. Bernales spoke of the relationship between Chile and St. Kitts and Nevis, through the Caribbean Community (CARICOM), and the Organisation of Eastern States (OECS). “Chile has a lot of programmes in developing, especially in management and mitigation of natural disasters that unfortunately both countries have a lot of experience on that but in different disasters. For example you have hurricanes or storms, Chile is very conscious and supportive about the climate change, for example that could affect and will certainly affect small island states. “At the same time Chile is offering many scholarships generally in the framework of CARICOM and OECS where I am appointed, as well, as a permanent representative at the OECS,” he explained. Ambassador Bernales stated that his country and the Federation have a lot in common and he is pleased with the active presence Chile has in St. Kitts and Nevis. He stated that his country’s presence in CARICOM intensified in 1993 after the military government. Later it established an embassy in the Federation. Based in Jamaica, he said he is honoured to serve as Chile’s ambassador to St. Kitts and Nevis and assured that his inaugural visit would not be his last. Meantime, in welcoming the ambassador to Nevis, Mr. Jeffers registered satisfaction with the visit. 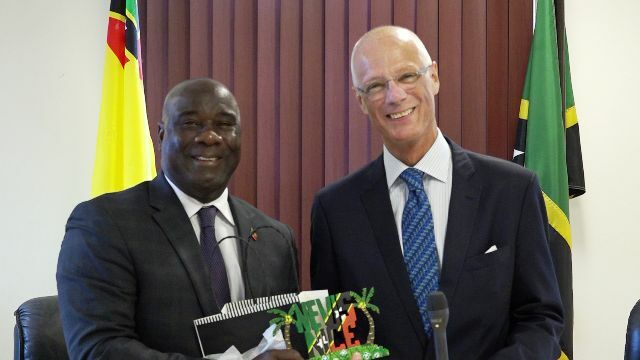 He used the opportunity to present a token of appreciation, which would serve as a reminder to the ambassador of his inaugural visit to the island. Chile is located in Southern South America with a population of 17,574,003. It was colonised by Spain and the official language is Spanish. Its culture is largely Spanish but exhibits many of the traits which typically characterise Latin American countries. The South American country is described as having a market-oriented economy which is characterised by a high level of foreign trade and strong financial institutions. While in the Federation, the Chilean ambassador also paid a courtesy call on Dr. the Hon. Timothy Harris, Prime Minister of St. Kitts and Nevis.